Create the best gingerbread sugar scrubs for stocking stuffers or hostess gifts with this project. 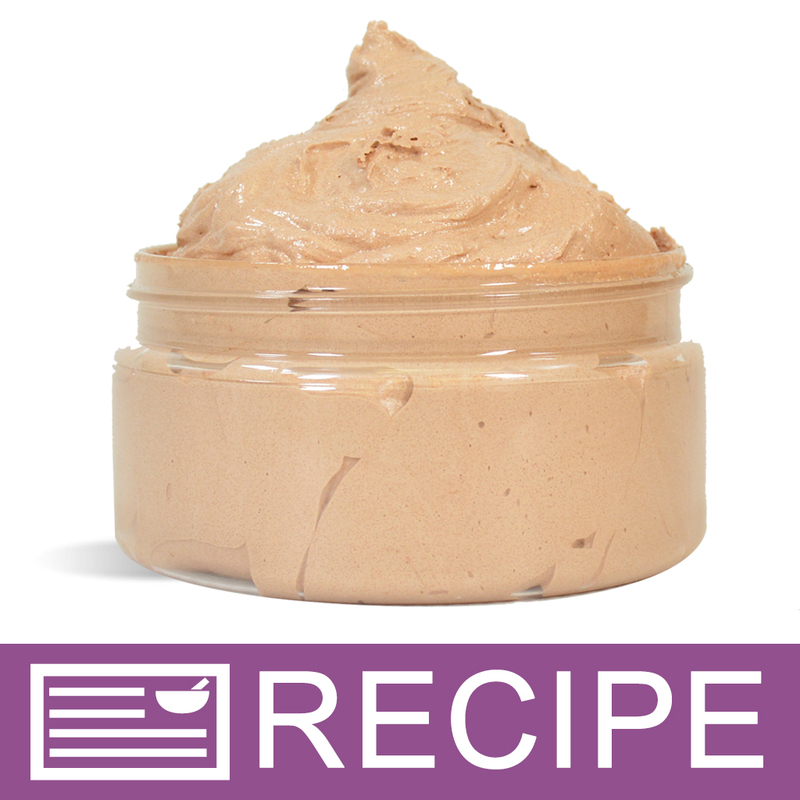 Foaming bath whip, melt and pour soap and sugar combine to make a gentle exfoliating scrub. The addition of glycerin will soften dry skin while the gingerbread fragrance adds scent notes that will make you think of the holidays. Aromas of freshly shaven nutmeg, clove, ginger and cinnamon will fill your home as you use this product. You Save $7.60 by purchasing this kit rather than buying the items separately. COMMENTS: I was so excited to try this kit. But it turned into a disaster. When I went to put my scrub in the containers there was way too much for the containers provided. I also noticed that most of the melt & pour had solidified to my bowl. Now these are probably errors on my part but I couldn't find any information on your site addressing these issues. I noticed other scrub recipes do not call for melt & pour, so perhaps others were having problems as well. I also purchased the press on seals & I couldnt get them to stick either. On the plus side it smells devine & I like the creamy consistency. I purchased the peppermint scrub kit as well so; hopefully, I will have better luck with that one. COMMENTS: I made this as a Christmas present for my little sisters and they loved it! It has a little bit of a strong Gingerbread smell when you first apply it but it mellows out as you wash it away leaving behind a nice subtle scent. The kit was very well organized and the directions were easy to follow. I think it probably took me about 30 min to and hour to make. I know it doesn't have any preservative in it, but I have not experience any issues with mold, and I leave it in my shower. Over all a very nice product. COMMENTS: I am very pleased with this purchase. This was my first attempt at handmade products. The recipe was easy to follow and the end product was exactly as I expected. My family and friends love it! COMMENTS: This kit was so simple to us. and quite fun to make. The final product was amazing. For someone who is just learning and experimenting, this was a major success! Looks and feels beautiful when finished. Tested on hands and left them feeling soft and clean. No urgent need for hand cream to be immediately applied, which is usually the case when I use anything to wash my hands. I was not crazy about the fragrance, so I did not use it. I substituted a lemon fragrance with a light yellow colorant. It was fabulous! I couldn't be happier with this kit. This is something I will continue to purchase. COMMENTS: I just made the ginger bread sugar scrub and it is awesome. My house smells divine and my family kept coming into the kitchen thinking was making something to eat. The kit made more than the 8 jars and we all tried it out and have to say it is fantastic and left our skin soft. I am excited to give it out this Christmas! This was my first kit that I have bought and am anxious to try some more! COMMENTS: Easy to make will buy again. COMMENTS: My Clients and Friends just loved the smell. They said they always wanted to eat it! COMMENTS: I enjoyed making this kit, the directions were easy to follow and the gingerbread fragrance smells great although a little sweet. Although I purchased these to add to my product line for Christmas, there was a little extra that I can't wait to try. COMMENTS: I bought this as my first project with WSP and I was truly pleased with the experience. Not only was this an "easy" project, it was really nice to discover that I had enough left over to almost complete a 2nd batch (I still have to purchase just a few things like jars to make the next batch though). Also, not knowing what to expect in terms of quality, it was nice to see that it's not a "junky" product, and leaves a nicely moisturized surface when used. I must say though that I over-whipped the batch, something that is easy to do. COMMENTS: This is one of my favorites. It's easy to make and leaves your skin so soft and smooth. COMMENTS: The scent was a bit strong when first pouring into the mixture, but over time and after they were all packaged, it softened up a bit. • Leaves your skin soft. "Sugar Scrub Kit - Debbies Best Ever (Gingerbread) "
COMMENTS: I absolutely loved making this Gingerbread sugar scrub! Wasn't very hard to make, and the Gingerbread scent is to die for. COMMENTS: I love this kit. I have never made a sugar scrub before so this kit made it super easy. I even have product left over to make it again with only a few items to replace. I love how my skin feels after using the scrub. " Best ever" for sure. COMMENTS: This kit walks you through step by step. What a great item I added to my product line. "What size liners do these jars take? Or do you recommend protective liners for this product?" Staff Answer You can certainly use a press and seal liner for this product. Liners correspond to the jar opening and lid size, which would be 89/400. You would want to use the 89 mm liners. "Does anyone have a great idea for labeling on this? Are there labels out there somewhere that are 1" x 8" to wrap around the clear part?" I find it easier to do some of the labelling on the lid - I use Avery 2" Round Labels on the lid with our brand name and fragrance, and then a 2" square label on the face of the jar for ingredients and instructions. I printed them on a clear labels with black font. Staff Answer If stored properly and as long as no water is introduced into the finished product, the shelf life should be 1 year after production. "Can I add a small amount of essential oil in the mix to make it a bit more moisturizing on the skin afterwards? If so, which oil would work?" Staff Answer You might try adding a carrier oil to the scrub for moisturizing rather than an essential oil. Any carrier oil you have will work in this recipe. "If we wanted white lids instead of black, we'd have to order separate instead of exchanging the lids? " Staff Answer Because we do not do substitutions on our kits, the white lids would need to be purchased separately. "I have tried to access the directions to Debbie's Best Ever gingerbread sugar scrub and get the gingerbread man soap information instead of the scrub info. "